Debenhams' sound system in a jacket designed to combat thieves | What Hi-Fi? No, whathifi.com hasn't suddenly turned into a fashion website. But we thought you might be interested in this snazzy new jacket from Debenhams, which includes a built-in sound system and controls for your smartphone or MP3 player. The idea is to protect your precious smartphone or music player from thieves when you're out and about. Given that 264 mobile phone thefts a day were reported in the first eight months of 2012 (a rise of 7% over 2011), that's no bad thing. The £76 coat is designed by Communiqué Vox (C.VOX) and includes headphones, speakers and the controls to skip, pause and play your music. There's a 3.5mm connector in one of the pockets which is compatible with smartphones and portable music players. And the speaker, microphone for taking phone calls and controls are all waterproof so the coat can be washed without damaging the system. 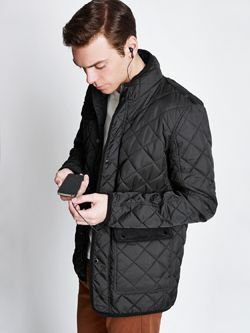 The earphones are wired through the jacket and concealed in the collar to avoid any unnecessary tangling. As well as the coat shown here, the C.VOX range includes gilets and hooded sweatshirts with a similar built-in speaker system.